Approximately 90 percent of the world's sheep produce wool. One sheep produces anywhere from 2 to 30 pounds of wool annually. The wool from one sheep is called a fleece, from many sheep, a clip. The amount of wool that a sheep produces depends upon its breed, genetics, nutrition, and shearing interval. Lambs produce less wool than mature animals. Due to their larger size, rams usually produce more wool than ewes of the same breed or type. Long wool sheep usually produce the heaviest fleeces because their fibers, though coarser, grow the longest. Hand spinners tend to prefer wool from the long wool breeds because it is easier to spin. Some sheep produce very coarse fibers. This type of wool is called carpet wool, and as the name suggests is used to make carpets and tapestries. According to the International Wool Textile Organization (I.W.T.O. 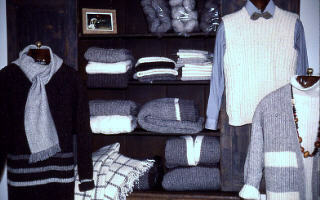 ), 41 percent of world wool production is classified as coarse wools. Medium wool sheep, raised more for meat than fiber, produce the lightest weight, least valuable fleeces. Medium wool is usually made into blankets, sweaters, or socks or it is felted. 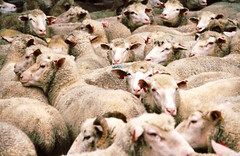 According to the I.W.T.O., 22 percent of world wool production is classified as medium wools. Fine wool sheep produce fleeces which usually have the greatest value due to their smaller fiber diameter and versatility of use. Garments made from fine wool are less likely to itch. According to the I.W.T.O., 37 percent of world wool production is classified as fine wools. Hair sheep shed their coats and produce no usable fibers. The "fleeces" from hair sheep and hair x wool crosses should be discarded. 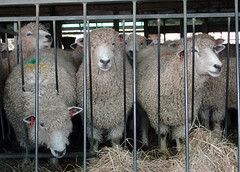 Their inclusion in a wool clip can contaminate the entire clip. 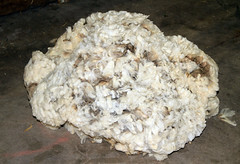 Even raising wool sheep along side hair sheep or other shedding animals could affect fleece quality of the wooled sheep. Hair will not accept dye. The value of wool is based on its suitability for specific end uses, as well as the fundamentals of the world wool market. 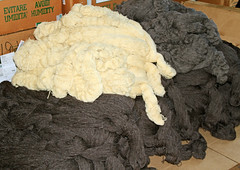 Raw wool is usually purchased on the basis of grade. Grade denotes the average fiber diameter and length of individual fibers. The grade (or price) is reduced if the wool is dirty and contains a lot of vegetable matter or other contaminants. In the commercial market, white wool is more valuable than colored wool because it can be dyed any color. Even the wool from sheep with white faces is more valuable than the wool from sheep with dark or moddled faces because the fleeces from non-white face sheep may contain colored wool or hairs which cannot be dyed. In contrast, naturally colored wools are often favored in the niche markets. In the United States, large producers of wool usually sell their wool to warehouses or directly to wool mills. Sometimes, the wool is sold on a clean (scoured) basis with the lower quality belly removed from the clip. Small producers often sell their wool (raw) through wool pools. In 2013, the average price paid for wool sold in the United States was $1.45 per pound (grease) for a total value of $39.2 million. In 2014, 26.7 million pounds of wool was harvested from 3.68 million head of sheep and lambs. 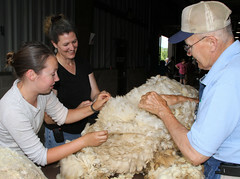 In the U.S., the average fleece weight is 7.3 pounds (3.32 kg), compared to almost 10 lbs. (4.5 kg) in Australia. In the US, Nevada sheep boast the heaviest fleeces weights: 10.4 lbs. in 2014. Sheep producers can get more money for their wool if they direct market it to hand spinners or add value to it. 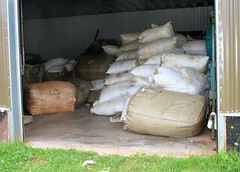 In niche markets, there is no upper limit as to what wool can sell for. Wool is a freely-traded international commodity, subject to global supply and demand. While wool represents only 3% of world fiber production, it is important to the economy and way of life in many countries. Though China is the largest producer of wool, Australia dominates the world wool market. China is the largest wool buyer. The United States accounts for less than 1 percent of the world's wool production and is a net importer of wool. In the U.S., the top states for wool production are California, Colorado, and Wyoming.